Case in point: think about how many types of analytics are out there. There’s data analytics, diagnostic analytics, predictive analytics, descriptive analytics, prescriptive analytics, web analytics and business analytics, just to name a few. We’ll touch briefly on the definitions of all these types of analytics and some basic differences between them, then dive deeper into the main focus of this article, web analytics and business analytics. We’ve already covered predictive, descriptive and prescriptive analytics before, so let’s focus on the other kinds: data analytics, web analytics, business intelligence tools, big data analytics and business analytics. Web or website data analysis is defined as the collection, measurement, reporting and analysis of web data used to understand and optimize web pages. It includes everything from web traffic metrics to market research to assess the website’s effectiveness. Web analytics software helps users collect data, process it into organized information, develop KPIs, formulate an online strategy and perform experiments to test UI changes. Business intelligence, or BI, is the overarching name for the group of technologies and methods used by organizations for the analysis of business-related data. This data provides historical, present and predictive overviews of a business’s key performance indicators (KPIs). Some typical functions include reporting, dashboards, analytical processing, data mining, event processing, process mining, business performance management, text mining, benchmarking, as well as both prescriptive and predictive analytics. The goal of BI software is for non-data scientists to be able to utilize data visualizations to draw conclusions from data sets. Then they can use these conclusions to glean insights and implement new business strategies. 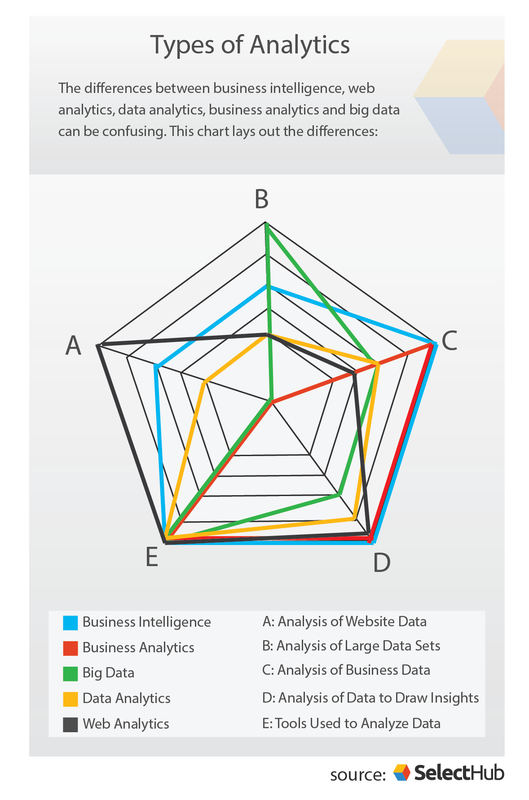 Web Analytics vs Business Intelligence: Business intelligence is the parent category for all types of data analytics used in a business setting, whereas web analytics focuses on website data. Big data is just what it sounds like: data that is large in volume, complexity or structure. Data analysts of the past had to tackle big data in small pieces at a time, but with software, we can structure and analyze this kind of data easily and efficiently. BI and BA systems often come equipped to handle big data, but this is not always the case — that’s why it’s important to determine your data needs before choosing a solution. Web Analytics vs Big Data: Web analytics is a tool that can process big data, which is a descriptor of the type of data. Similar to business analytics, data analytics is the process of analyzing data to draw conclusions. Business analytics can be understood as data analytics applied specifically to help businesses make data-informed decisions. Web Analytics vs Data Analytics: Web analytics is data analytics that is restricted to your website. As a subcategory of BI, BA is the study of data using operations and statistical analysis, predictive models and optimization techniques. This used to be the purview of highly-trained data scientists combing through huge amounts of unstructured data by hand and manually drawing conclusions from patterns they found. While that is certainly still a way to parse data, the technological age has brought advancements in software that allow average employees to perform the same kinds of analysis. Data Analytics vs Business Analytics: Business analytics utilizes data analytics in a business setting to help managers make data-driven decisions. Both web analytics and business analytics help businesses improve their data-driven decision-making processes. But the biggest difference between the two lies in what types of decisions are made based on that analysis. Web analytics — which analyzes website metrics — aims to improve your online presence. Mainly, this means increasing overall web traffic, including the number of visitors, visits and page views. One way users can do this is via search engine optimization (SEO). Web analytics like Google Search Console can identify the keywords drawing visitors to your site in order to make your content more relevant and appealing to your audience. You can also sign up for automated alerts when there is an issue — a crawling error, for instance. Web analytics also helps optimize your website’s performance. Because what’s the point of having a highly-trafficked website if it doesn’t help your bottom line? To maximize your website’s effectiveness, you have to increase your customer base by onboarding new leads. For example, making sure that your calls to action (CTAs) are effective is one key strategy. Web analysis can deliver data, such as conversion rates, that you can use to improve your CTAs, so you’re generating as many leads as possible. While web analytics works to improve your website, business analytics help improve your whole business. The uses of business analytics are almost limitless as long as it has definable metrics. Using big data analysis capabilities, website analytics software helps you dive into the data related to your customers, business processes, employees and more. Like business intelligence, business analytics predicts outcomes and forecasts performance by studying past results. It creates reports and predictive models from proprietary data to reveal valuable trends and insights. As you probably know, data is the most important component of analytics. Without it, you can’t perform any analysis. Which leads to another of the biggest differences between web analytics and business analytics: the type of data analyzed. Web analysis, as we mentioned earlier, analyzes data from your website, including data related to your users, your site visitors, site visits, page views and other web metrics. This means that the data it analyzes is very focused and narrow, related exclusively to your website. After developing KPIs such as the number of monthly site visitors or CTA conversion rates, you can use web analytics to discover whether or not you achieved those KPIs. That being said, web analytics platforms can definitely be integrated into larger BI systems to give you the specificity of web analysis in conjunction with the power of larger BI platforms. Business analytics, on the other hand, analyzes all of the data that you tell it to. Any kind of data, from how many hours each employee works to your monthly product sales to inventory information, falls under business analytics. This means you can boost more than just your marketing efforts: business analytics helps turn your entire company into an efficient, data-driven business. Business analytics also involves more robust, in-depth analysis. Using techniques like statistical analysis and quantitative analysis provide insights into why you experienced a particular result. For example, it could find a correlation between excessive time off being taken by warehouse employees and a higher amount of late shipments. Or let’s take a more complex example: you might see that less vacation time taken off actually correlates with worse sales outcomes. This could mean that your employees need more time to recharge in order to be their most productive selves. You can then use the information gathered and analyzed by business analytics to implement changes and conduct A/B tests if necessary. This involves testing two different versions of the same thing: two versions of your website’s landing page, different taglines for pages, etc. A/B testing allows you to isolate variables and test out courses of action without going all-in on those changes, mitigating potential failures. Finally, using predictive modeling, you can forecast future results that you can use while planning for the future. Say your testing found that sales reps who are allowed more vacation time actually perform better: you can use algorithms to predict how this better performance will relate to the lost revenue for more vacation time to predict if it is something your organization can afford in the long-term. Last but not least, we come to the final difference between web analytics and business analytics: the type of software used. Web analytics involves simpler analysis than business analytics. Therefore, the software you use for it doesn’t need to be particularly robust. Typically, the main features of web analytics tools include data collection and reporting. Google Analytics, the most popular web analysis tool, doesn’t create sophisticated predictive models (at least not yet) — but you usually don’t need it to. You just need to be able to see the data on your web traffic, page views, page referrals, etc. and view the trends in a report. If you want predictive modeling of your web analytics data, you can use business analytics software. The data analysis performed by business analytics is much more detailed and sophisticated, so it needs to be more robust software than web analytics. Good predictive analytics aren’t easy, you know. This comes with additional costs to purchase and train your users to use the software. Business analytics software needs to be able to do much more than collect, store and report on data. It needs to be able to create predictive models, while continually updating those models as it collects more and more data. Real-time dashboards allow users both macroscopic and microscopic overviews of their organization that put them more in control than ever. Plus, it needs to be able to aid in data mining, so you can extract every possible insight from your data. Once they’re broken down, the different types of analytics aren’t all that difficult to understand. To recap, data analytics is any kind of data collection with the intention of analyzing it to improve business practices — any size business can use it through a variety of tools. Web analytics involves the collection and analysis of your website data, with the goal of improving its performance. It can be integrated with other tools in this list, but focuses on website data only. Business analytics involves the collection and deep analysis of any type of data that your business collects. Big data is any data set used by any of these processes that is particularly large in volume or scope. Business intelligence, the parent category of the rest of these practices and tools, is the practice of using data to make better-informed business decisions. While all types of analytics contribute to a better data-driven decision-making process, they each require their own unique type of software. Now get out there and start discussing analytics with confidence! Do you have more questions about the types of analytics? Let us know in the comments!